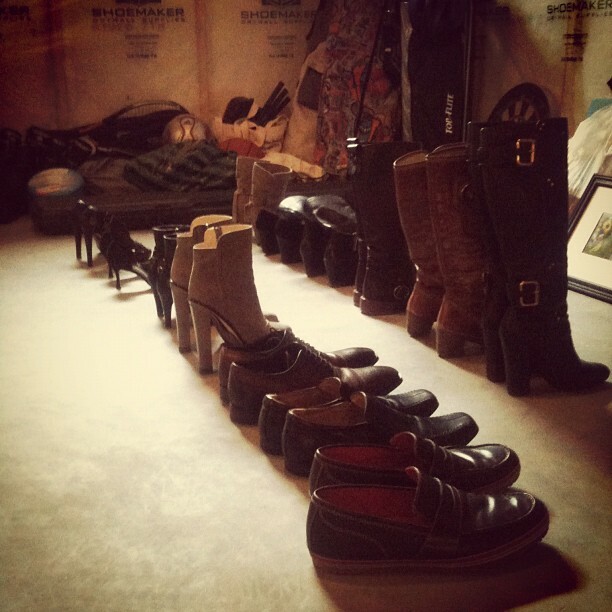 Shoe round-up in the basement!! Living in Alberta, it's an uphill climb to keep our shoes from being destroyed by the nasty winter snow, salt, and gravel. The only way to slow down the losing battle is to either not wear those cool boots at all - or give in to those up-selling shoe stores and buy all the protective products they push. It's such a chore to clean, moisturize, polish, and spray every pair. The fumes from leather protectant are aweful- you'd hope they can make a nicer smelling spray. But it's got to be done! And for those gals that love the nice leather-soled shoes or the smooth lipstick red soles of Louboutins, I highly recommend getting the soles covered with a thin layer of rubber at a shoe repair place. Sounds lame, but if you plan to wear them often, those beautiful soles do get ruined. 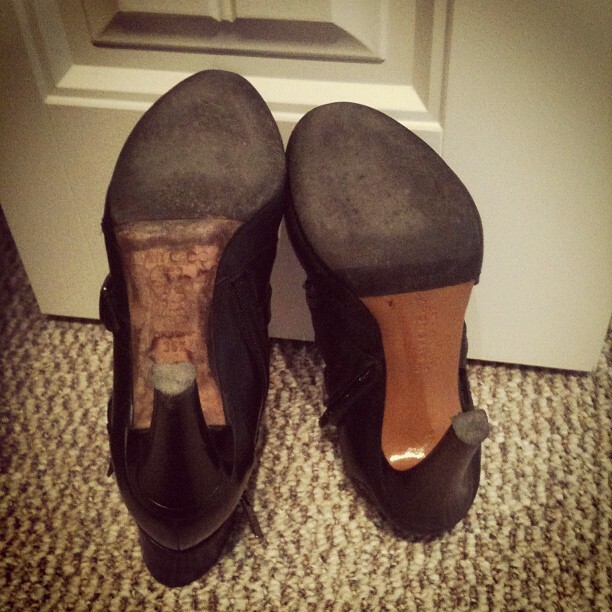 Even after just one wear, trust me! Not only will the layer protect the shoes, they bring traction that was non-existent before. You don't want to biff hard while wearing Loubs, do you? The trick is to find a good shoe place. I learned that the hard way. One "un-named" place in Chinook Mall in Calgary had destroyed a pair of my Jimmy Choo boots for $40! They smeared black tar/oil over the entire sole! But then I had an awesome shoe cobbler in Moscow just a few blocks down from my apartment. He couldn't understand any English at all but sign language works wonders! For 200 roubles a pair (that was approx $8 US back in 2008) it was so worth it... see the photo below and see his work compared to the crap job the other place did. Right: Oh how I miss my Russian shoe cobbler!